How does the Android tablet match up against the 4th gen iPad? Google may have called off the event, but it did not hold off the announcements as it unveiled for the first time its Nexus 10 Android tablet that will run on the latest Android 4.2 Jelly Bean OS update. Following news of the iPad Mini and the new iPad last week, Google is set to take on the Apple's larger tablet device once again this time with a pretty impressive specs list. Is it enough to worry the chaps at Cupertino though? We take a look at how the Nexus 10 shapes up against the new iPad. Nexus 10: Google has swapped ASUS for Samsung when building its larger Nexus tablet and while we don't know the specifics of the materials used, it's clear that it is inspired by the Samsung Galaxy Tab 10.1 2. At 603g it is lighter than the iPad 4, and at 8.9mm thick it just nips the Apple tablet in the slender stakes. New iPad: Not shying too far away from the design characteristics of the new iPad, the latest Apple tablet is made from an aluminium and weighs in at 652 g (Wi-Fi) and 662g (Wi-Fi and 3G) and is just 9mm thick. Nexus 10: The standout hardware feature is the 10-inch display which boasts a 2560 x 1600 resolution and delivers an impressive 300 ppi for excellent levels of clarity. There's also Corning Gorilla Glass 2 to improve viewing further and add another level of protection. New iPad: Toting a 9.7-inch Retina display with IPS tech for wide viewing angles, the iPad 4 boasts 2048 x1536 screen resolution with 264 ppi which going by the numbers, is less than the Nexus 10. A fingerprint-resistant coating also means the Apple tablet should stay relatively smudge-free. Nexus 10:So far we know that the Nexus 10 will sport a 5-Megapixel camera capable of shooting 1080p HD video while the front-facing snapper will feature a 1.9-Megapixel sensor and can deliver 720p HD quality video for your Google+ Hangouts and Skype chats. New iPad: With a 5-megapixel rear-facing iSight camera with autofocus, you can expect backside illumination and a f/2.4 aperture for low lit photography and face detection amongst other typical modes seen recently on the iPhone 5 and iPad 3. It also packs a front-facing 1.3-Megapixel FaceTime HD camera for 720p HD video chats and can also shoot 1080p HD video with image stabilization to keep things steady. 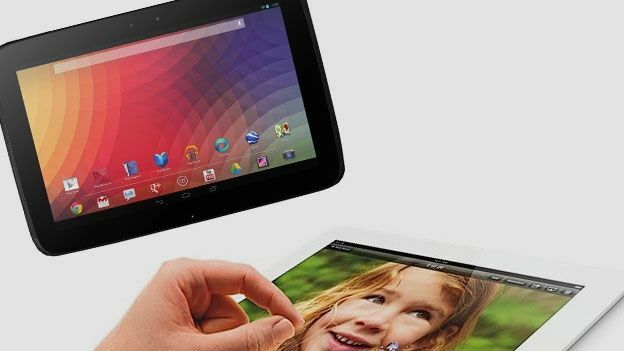 Nexus 10: The 10-inch tablet will run on Android 4.2 which is a new flavour of Jelly Bean bringing new features like the ability to take 360 degree panoramic photos, have multiple user profiles and a revamped Google Now. You can also expect UI slickness courtesy of Project Butter and many of the new features announced for the first variation of Android Jelly Bean. New iPad: Set to get the iOS 6 treatment, the latest Apple OS promises a slightly tweaked user interface with a new look App Store and iCloud support, a smarter Siri that will launch apps, FaceTime over 3G and TomTom-powered Apple Maps. It's still one of the best mobile operating systems and we expect it be as slick on the smaller Apple tablet as it is on current iOS devices. Nexus 10: Under the hood is a dualcore ARM-based A15 chip similar to the architecture found in the iPhone 5 and a quadcore Mali T604 GPU. With 2GB of RAM, it's should be within the Samsung Galaxy Note 2 realms of multitasking. New iPad: Nestled inside the fourth generation tablet is the brand new 1.3GHz A6X dualcore processor which Apple claims will deliver twice the CPU performance and twice the graphics as the A5X chip which lies inside the iPad 3. In the RAM department, there's 1GB to take care of multitasking. Nexus 10: There's no news of 3G or 4G support, but the Nexus 10 does Feature a dual-band 802.11 b/g/n Wi-Fi with the same MIMO data transfer technology as seen in the Kindle Fire HD.That means users can expect strong Wi-Fi reception and smoother video and music streaming than most Android tablets currently on the market. Bluetooth 4.0 is also under the hood with dual-side NFC (or Android Beam) and in terms of physical connections Micro USB and HDMI support but no sign of SD card support. New iPad: Apple claims that the dual band 802.11n Wi-Fi on board will deliver perform twice as good as previous iPad models, while LTE compatibility on top of the standard 3G support means its primed for 4G and features the latest version of Bluetooth. In terms of physical connections there's the new slimmer Lightning connector with a 3.5mm headphone jack and a Micro-SIM card slot to take care of making calls and using that data plan. Nexus 10: Packing a monstrous 9,000 mAh Lithium polymer battery, you can expect seven hours of web browsing time, 90 hours of music playback and an impressive nine hours enjoying video from your Android tablet. New iPad: The Apple tablet should make it through the day with Apple promising 10 hours of battery life over Wi-Fi and nine hours over 3G/4G before you have to hook that Lightning connector up again, which is good news considering the comprehensive tech that has been packed inside. New iPad: Kicking off with the 16GB Wi-Fi only model, those looking to snap up the iPad 4 will need to part with £399 with those requiring 32GB or 64GB of internal storage having to splurge £479 and £559 respectively. On the Wi-Fi + 3G front, wannabe iPad 4 owners looking to access the web at will need to part with £499, £579 or £659 depending on their choice of 16GB, 32GB or 64GB storage options. So comes out on the specs shootout? Well, there is clearly not much between the two tablets. From the screen technology to power, the Nexus 10 has the potential to go toe-to-toe with the latest iPad, but some might be disappointed that there is no 3G/4G support and seems to have followed the Samsung Galaxy Tab 10.1 2 in the design department. Specs are irrelevant if it's not backed up by the performance and as we are yet to get our hands on time with the Nexus 10 or the new iPad it's impossible to make a judgement on which one is better. What we can say is that the Nexus 10 clearly has the features (and the price) to be an iPad conqueror. Nexus 10 or New iPad? Which one would you buy? Let us know in the comments section below.